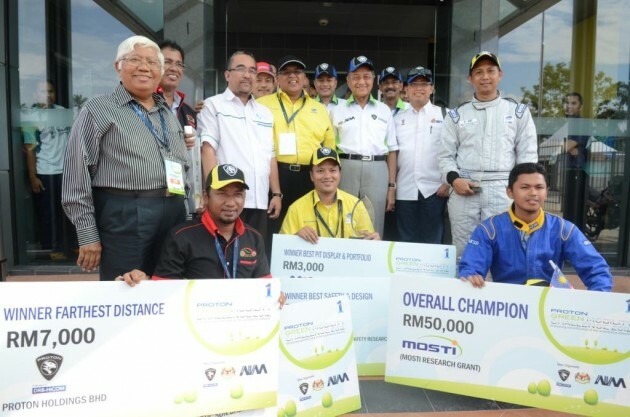 The International Islamic University Malaysia (IIUM) bagged the overall honours at the inaugural Proton Green Mobility Challenge (PGMC), held at the Sepang circuit last weekend. Their Saga EV, named ‘Smart Mobility,’ also won the Farthest Distance and Fastest Two Laps challenges. The team took home cash prizes, a MOSTI (Ministry of Science, Technology and Innovation) research grant of RM50,000, a trophy and an internship opportunity with Proton. IIUM team driver Nasruddin said their car had an effective cooling system, which enabled efficient use of the battery. “It (cooling) definitely helped us in the challenges,” said the 24-year old mechanical engineering student, who is in his final year. First and second overall runners-up were Universiti Malaysia Pahang with ‘UMP EV’ and Universiti Teknikal Malaysia Melaka (UTeM) with ‘Evergreen.’ There were also prizes for the four individual challenges, namely Farthest Distance, Quarter Mile Acceleration, Fastest Time for Two Laps and V-Max, as well as eight other prizes including Best Safety and Design and Best Innovation. UTeM team leader Dr Ir Mohd Nazri also cited cooling, as well as the battery management system, as important issues to consider for EVs. Their car also won the V-Max challenge, topping out at 126 km/h. Ex-Prime Minister Tun Dr Mahathir Mohamad was among the distinguished guests present to give away the prizes. He said PGMC was “a good effort” towards improving the country’s engineering capabilities, particularly in green technology. Jointly organised between Proton and Agensi Inovasi Malaysia (AIM), PGMC saw 10 selected university teams, made up of lecturers and students, compete to develop and build fully-electric Proton Sagas. The aim: to seek innovative electric vehicle ideas from universities and see if the challenge to turn a fossil fuel-powered car into an eco-friendly EV has been met. 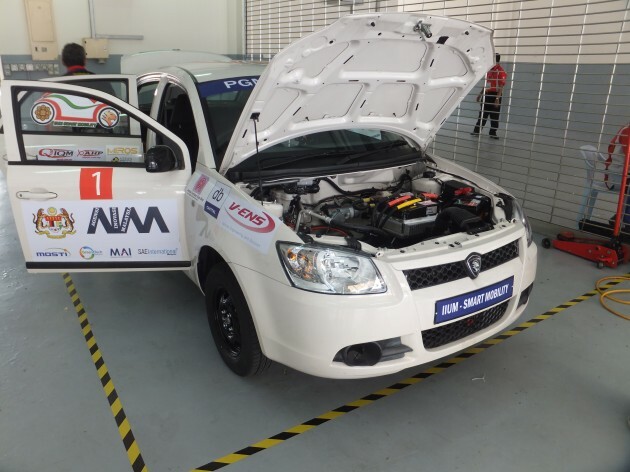 Each participating team received a standard Proton Saga, one lithium-ion polymer battery, a 30 kW electric motor and controller, brake booster vacuum pump, four standard 175/70 R13 tyres as well as RM20,000 development seed money. They then had nine months to convert their Sagas into EVs, while keeping within event regulations, culminating in the four final on-track challenges. The universities that participated were UTP, UNITEN, UTeM, UNIKL MSI, UMP, UNISEL, IIUM, UTM, UNIMAP and UKM. Watching the all-electric Sagas drive silently around Sepang was a surreal but interesting experience – if you’re wondering what it’s like to drive a Saga EV, you can read Danny’s test drive report. is saga blm weight same with flx? Almost the same, but its ignored in the competition as the engine and most components were removed. maybe more challenges in the near future huh proton. Perodua, no myvi EV ah? Last time, it is something like yearly 12 hour “Merdeka Millennium Endurance” or “Merdeka Endurance Race”, also participated by the like of Karamjit Singh, Alex Yong, and foreigners! What benefits these events to Malaysia automotive industry in term of product development and innovation? Except that we are force to continue to pay for crappy taxes under NAP! And now they are not short of any kind of syiok sendiri idea – Proton Green Mobility Challenge (PGMC), also come with catchy slogan and keywords like innovation, R&D, engineering capability, green technology, etc. 1) The syiok sendiri with long list of categories awards, waste tax payers monies and consumers still have to pay crappy taxes under NAP! 2) Innovation and R&D! These are just “marketing jargon” used by 2nd/3rd grade local U students and Professor Kangkong syiok sendiri syndrome to camouflage their crass endeavor! 3) The possibility for their commercialization is 0.00% and waste tax payers monies probability is 100.00%! Enjoying my bánh mì and cà phê from VN! Let it go la…jeezz what actually happened to you ? Masa sekolah dulu selalu kena buli ka..
Do you think all engineers grow on trees? this kind of activities are needed in our country..
do not brain drain like certain malaysian..
government shud allocate more research funds colleages & universities..
To be honest, I actually am expecting more technical information, especially technology related, from ALL of the Sagas. Could anybody from PT please dig deeper pertaining to this request? I’m sure I’m not alone in this. UTEM build their own charging system & battery management system. UTM has the best packaging & best engineered EV (well, PROTON EV lab is in UTM). UIA got running aircond. Fastest car that didnt win was UTP, release at 9th (one car at a time, 20 seconds apart) spot, overtake everyone except UIA but system failure (anyone know what happened?) 100 m from finish line. Utp main power cable was short circuited before d final day. They workedthe whole night to overhaul the wiring system. The team supposed to win the best innovation but due to tech prob the award was given to utm. Alot of politics indeed. What kind of technical problem? Proton played politics to much. Utem, unisel & uia were among the fastest teams. Ump wasn’t in the top 3 list and was among the last one. It is shocked that ump was announced as the winner for quarter mile and 1st runner up for the whole race. Previous Post: BMW ActiveHybrid 3 test drive review – is it just a 335i with an electric motor, or more?